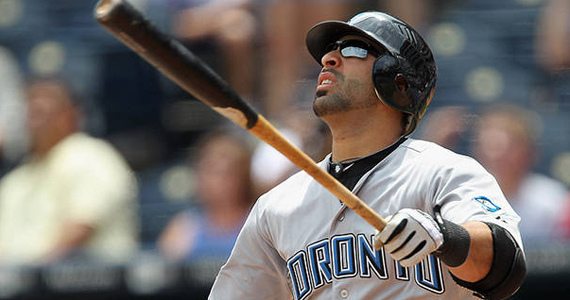 On Sunday, Bautista slugged three home runs against the Twins, which brought his total for the season to 16 in 32 games. Going back to September of 2009, he now has 80 home runs in his last 223 games. Where did this all come from? I have no idea, but let’s find out a little more about José and his magical power bat. December 15, 2003: Drafted by the Baltimore Orioles from the Pittsburgh Pirates in the 2003 rule 5 draft. June 3, 2004: Selected off waivers by the Tampa Bay Devil Rays from the Baltimore Orioles. June 28, 2004: Purchased by the Kansas City Royals from the Tampa Bay Devil Rays. July 30, 2004: Traded by the Kansas City Royals to the New York Mets for Justin Huber. July 30, 2004: Traded by the New York Mets with Matt Peterson (minors) and Ty Wigginton to the Pittsburgh Pirates for Kris Benson and Jeff Keppinger. So all of those transactions left him back on the Pittsburgh Pirates by season’s end. Nice journey. After a couple of mediocre seasons for Pittsburgh, they shipped him to the Toronto Blue Jays in 2008 for a player to be named later. In 2010, he gave the Jays 54 home runs to be named later. His 54 homers in 161 games in 2010 were 4 less than he had in 575 career games before then. To say that his power output came out of nowhere is a huge understatement. He went from 1 HR every 24.4 plate appearances to 1 HR every 11.9 plate appearances since. He has more than doubled his home run rate. According to Bautista, Blue Jays hitting coach Dwayne Murphy (back then a first base coach) suggested he change his approach in late 2009 because he was late on every pitch. He suggested Bautista be more aggressive and attack the ball more. Somebody give that man a lot of money… or take him to jail. He’s created a monster. Bautista should cut him in on every contract he ever signs. So now what do I do? I have to re-channel all the hatred and disbelief i have held towards Bautista for the last couple of years… Looks like I’m gonna have to discover a new fluke (Looking at you, Phillip Humber). In fact, i am kind of embracing José. In the post-steroids era, it’s nice to see someone cleanly hitting a ton of home runs (unless he had the Bartolo Colón stem cell procedure). I hope he hits 60 home runs this year (58 will be to left). All Hail José Bautista! The Greatest slugger in the world.